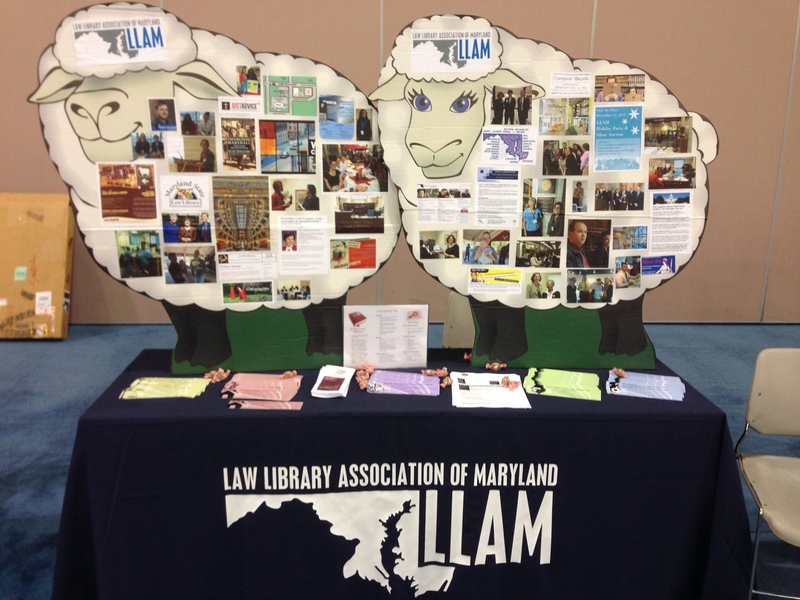 The Law Library Association of Maryland (LLAM) has a new logo and color scheme! Take a look at the top of our webpage to see the new logo, which incorporates an outline of Maryland with our acronym. Special thanks to Jenny Rensler for updating our webpages with the new look! Thanks to Mark Desierto for organizing our efforts to obtain logo proposals and bids from several graphic artists. Thanks to Mark, and also to Rachel Englander, for helping us obtain tablecloths with new LLAM logos for vendor halls and displays. The new tablecloths are navy blue with a white logo outline, matching the one posted at the top of our webpages. Special thanks also goes to Kate Martin for getting this project moving at the very beginning! In addition, our new LLAM tablecloth and logo made their first appearance recently in the vendor hall of the 2015 AALL Meeting & Conference in Philadelphia. Special thanks to Immediate Past President Kate Martin, who handled table arrangements and displays. Also, thanks to Mark Desierto, who managed the logo proposals and ordering of the two new tablecloths (which are identical, but in different sizes). I don’t see the logo in the banner at the top of the page????? I thought the tablecloth looked very classy at AALL conference, Thanks to all involved.